April 1 is the feast of a little-known saint whose story demonstrates the power of the Church as the home of forgiveness, redemption and mercy. St. Mary of Egypt was a prostitute for 17 years before she received the Eucharist and chose the life of a hermit. Born in 344 A.D., Mary of Egypt moved to the city of Alexandria when she was 12 years old and worked as a prostitute. With the intention of continuing her trade, she joined a large group that was making a pilgrimage to Jerusalem for the Feast of the Exaltation of the Holy Cross. On the feast day itself, she joined the crowd as it was headed to the church in order to venerate the relic of the True Cross, again with the intention of luring others into sin. When she got to the door of the church, she was unable to enter. A miraculous force propelled her away from the door each time she approached. 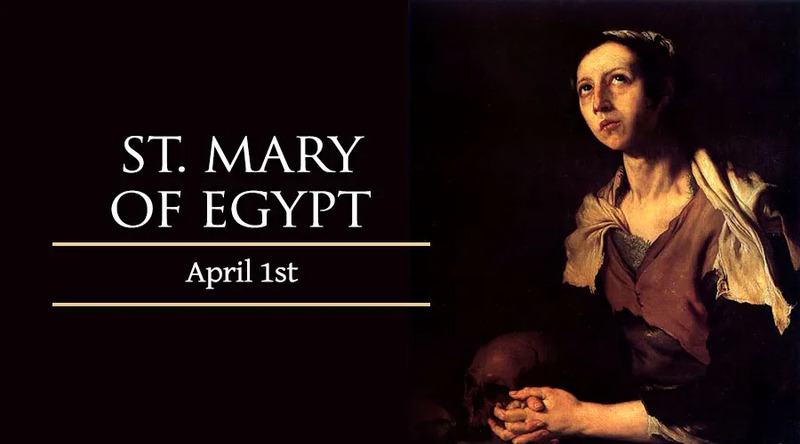 After trying to get in three or four times, Mary of Egypt moved to a corner of the churchyard and began to cry tears of remorse. Then she saw a statue of the Blessed Virgin. She prayed to the Holy Mother for permission to enter the church for the purposes of venerating the relic. She promised the Virgin Mother that if she were allowed to enter the church, she would renounce the world and its ways. Mary of Egypt entered the church, venerated the relic and returned to the statue outside to pray for guidance. She heard a voice telling her to cross the Jordan River and find rest. She set out and in the evening, she arrived at the Jordan and received communion in a church dedicated to St. John the Baptist. The next day, she crossed the river and went into the desert, where she lived alone for 47 years. Then, while making his Lenten retreat, a priest named Zosimus found the hermitess. She asked him to return to the banks of the Jordan on Holy Thursday of the following year and to bring her Communion. The priest was true to his word and returned bearing the Eucharist. Mary told him to come back again the next year, but to the place where he had originally met her. When Zosimus returned in a year’s time, he found Mary’s corpse. On the ground beside it was a written request that she be buried accompanied by a statement that she had died one year ago, in 421 A.D., on the very night she had received Holy Communion.